OK. I want to have plain (Life Stories) versions of sidings. I know there's a vote for Wedding Cake Sidings. I think the Tulip Grove sidings are ones that we want as well. Of these, do we want to use the existing colours (which may or may not match with our linen colours) or do we want to have them made-up in our linen colours? The reason I ask, is I have templates for the 1st 2, but Tulip Grove siding is one that I tried and failed at. So if someone else has a template for them, that would be grand. (By template, I mean being able to change the colours in the trim). I'd actually love to have Wedding Cake set in all the Tulip Grove colors! I use the ones you've done all the time in Pleasantview along with Tulip Grove and another by Holy Simoly that's missing totally from their site called Pickett Lane which I keep meaning to expand as well and may have templates somewhere also. 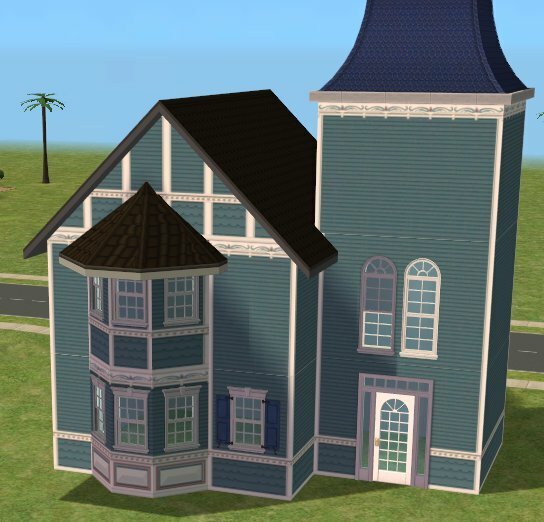 My last must-have siding is the Marina Sims Victorian Set in all its colorways. It's my go-to set for Riverblossom Hills. I've always planned to do it in some US coastal New England-type colors for Bluewater Village, but haven't gotten to it yet, since I haven't played Bluewater in a long time. I'm quite happy to do Tulip Grove Colour schemes for the Wedding Cake and Plain Sidings, and I'm also happy to expand the Tulip Grove set with some plainer ones. I found Pickett Lane on TSR, but I have them both. I've always been a little disappointed that the Pickett Lane/Tulip Grove wasn't a complete set. So am happy to do those ones. I'm not that familiar with the Marina Victorian, although I'm also happy to do use that colourways for them. How's about what I do first is the non-default versions and put them up here, and then depending on how you like them, we can default them as well. I love making walls... I know that I'm a bit crazy - but there you go. Proof positive! If there's any other walls you'd like made for your own use, let me know. Do you want the Bay Window without the Crown as well? I haven't done it, but realised as I was building the test building that it would have been useful. I've done the Teal and White as a test set, and it's got 17 pieces as well including the 4 it came with. Also - I've purposefully not cleaned up the textures so that they match the existing walls. Have a play with them and see what you think. I can actually clean up most of the textures for this (apart from the tulip which is a rude-word) but it would mean replacing the existing set as well. Yes, I would like the Bay window without the crown. I just got you new template to play with and it might be worth making a comparison test for cleaned-up textures vs. old textures to see if it would be worth-while to redo the whole set. I think to yellow would be the best to try it on as light colors show imperfection more. Coolness. Will add that to the list for tomorrow. Kiri. I added a board to this section for your walls when you are ready to upload them! My plan is to load some stuff up this weekend. I feel like I've been a bit horrible sitting on them. Completer Set for the Tulip Grove are now with you. I'll do the Pickett Lane Completer set next, then Marina's completer sets. Then I'll do Tulip Grove colours for the Wedding Cake. Then Marina's colours for Wedding Cake. Do you want Marina's colours for Tulip Grove as well? Also - if you let me know what the US Coastal Marine colours are, I can do all 3 sets in that as well. I meant to reply to you yesterday, but I got caught up in playing with my new walls! I decided to restart the uberhood and rebuild Pleasantview. Tulip Grove was always my favorite set for that- building codes are very strict in my Simlandia towns, and Pleasantview is very Victorian-country, turn-of-the-century brick, country-fair in tone. So Pickett Lane and Wedding Cake fit right in. I would love Marina's colors on Tulip Grove! I'm so greedy, I'd love all the colors on everything, but please, only do what you'd LIKE to do! I would hate to take advantage of your good nature, or cause any of this to become a chore, so feel free to stop at any time! I see what I can do to get a palette posted for that Coastal Marine look- off to the paint store sites! So pleased you like them! I did them as much for me, because I love that set, and have always been put off using it because it was missing the pieces that I needed. The Pickett Lane is also one for me - I love the colours, and some of the details. Some of them I'm not over joyed with - but making the completer set will be a joy to me. I've started on the Pickett Lane - they're an interesting set, because they actually have Blue, Mauve, Mint, Rose and Yellow - but the Mint and Rose have darker shades of siding, and Mauve and Yellow don't have the full set at all. The full length spikes are tailored to include a chair rail - I'm not sure that we want that - so I may fiddle with a new pattern for the spikes. I will do the spikes as LHS and RHS as well. So this set is going to be much larger than the Tulip Grove, for fairly obvious reasons. 2 sides of the Tulip Panel - however I'm going to clean that one up I think, I've never been overly happy with the curve - it's been wrong for the quality for the rest. I think I'll also probably do the other panel in my panel template - that's the left and right arrow, and the half and quartered as well. To be honest, I think I'm more excited about using the Pickett Lane colours on the Tulip Grove siding. You do realise of course, that I will want to see pictures of your Pleasantview! The closest to complete is Don Lothario's (he's moved out, it's not really his sort of place anymore). I just needed a new door, and a fence, and gate, and porch swing. Nobody will live there yet as I'm not sure just who is moving to Pleasantview. I always do that set of houses first as it doesn't fit my aesthetic for the town. My Pleasantview is a bit farther north than Maxis has it, and there are NO palm trees at all!